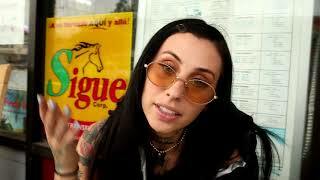 Kreayshawn, is an American rapper, creative director of OK 1984 and music video director from Oakland, California. In 2011, while serving as a member of a rap group with her friends, she released the music video to her debut single, "Gucci Gucci", to internet viral success. The popularity of the song and its video led to a recording contract with Columbia Records soon after. Kreayshawn released her debut studio album, entitled Somethin' 'Bout Kreay, on September 14, 2012.